• Place it in the sieve with heavy weight on it and let it stand for an hour to drain the liquid in it. • Blanch the tomatoes in the boiling water, as it cools down peel the skin, chop and set aside. • Heat a non-stick pan add ginger, garlic, onion, cashew nuts, clove, cinnamon, saunf, green chilli and saute for 2-3mins or until the onions are slightly brown in colour; Turn off the flame and let it cool down a bit. • Now throw the blanched tomatoes into the blender/mixer and blend it to smooth puree and transfer to a bowl and set aside. • Then blend the sauted onion mixture to smooth paste and set aside. • Now heat a not stick pan add cubed capsicums and sprinkle some oil, salt and toast until tender but still crunch (approx. 3-4mins) transfer to the plate and set aside. • In the same pan shallow fry the tofu until golden brown on each side, about 3-4minutes per side on a medium high flame and remove on to the plate and set aside. • Then heat oil in the pan and add the onion masala paste and stir fry until light brown 3-4minutes add red chilli powder, turmeric, coriander powder, cumin powder and mix well. • Add tomato puree and stir fry for 3-4mins again / until the mixture thickens a bit. • Add salt, milk corn flour mixture and simmer for 2-3minutes. • Then add in the sauted capsicum,tofu, kasoori methi and cook for 2 -3more minutes by stirring occasionally in between. • Turn off the flame and transfer the gravy to the serving bowl. 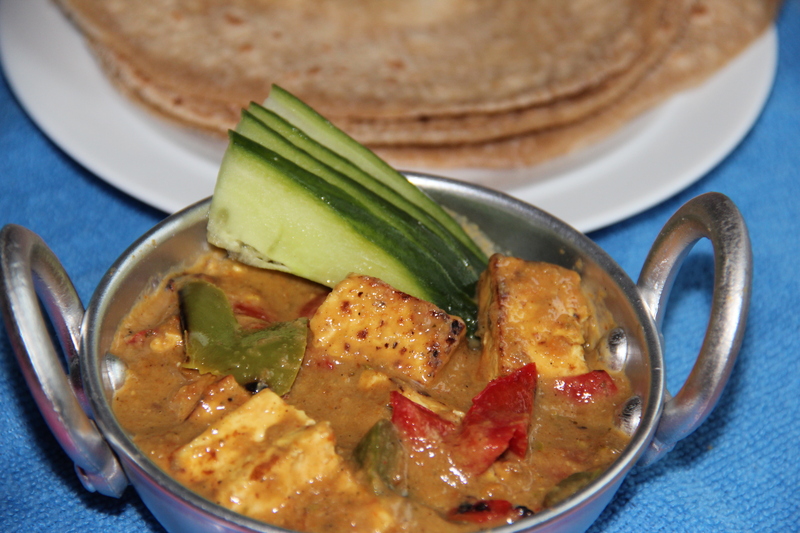 • You can even use paneer instead of tofu. • You can even use regular milk instead of almond milk. • You can even saute the tomatoes along with onion. Posted on June 10, 2014, in Indian, Side dish, Vegan and tagged capsicum, drchdietfood, Indian Side dishes, Tofu, Tofu capsicum gravy, Tofu curry, Tofu dishes, Vegan cake, Vegan recipes. Bookmark the permalink. 10 Comments. Priya – you have an amazing site just focussing on diabetic recipes…awesome..
Chitra, I haven’t even finished making this yet, but I have to say that onion masala paste is delicious. Of course it was excellent. We both loved it. I made a few adaptations in the nuts and spices, that was all. The next time I do a food related post I will try and remember to add a link to yours and your wonderful recipes. Many thanks for sharing.